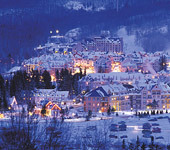 If you’re looking for a truly magical skiing experience for your students, then Tremblant is certainly for you. This purpose-built Canadian ski resort is very popular with British skiers, so you can be certain you’re on to a winner when you book a school ski trip to Tremblant. This truly beautiful ski resort is famous for its traffic-free cobbled streets and colourful buildings, and is so magical it’s sometimes referred to as the ‘Disneyland of winter ski’. At this lovely ski resort in the Laurentian Mountains, you’ll stay in 4* suites in the heart of the village, where everything you could possibly need, including the skiing, will be right on your doorstep. 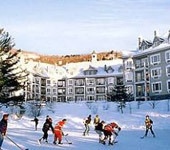 The largest ski resort in Eastern Canada, there are a varied set of runs at Tremblant - so skiers and snowboarders of all abilities should be satisfied. The wide motorway runs are great for beginners and the dedicated beginners’ area comprises of 2 acres. The easy top-to-bottom green runs are great for intermediates, while there are also a good number of testing black diamonds for more advanced skiers. The piste grooming here is excellent too. And snowboarders won’t feel left out either, thanks to the 30 acre Adrenaline park and half-pipe. 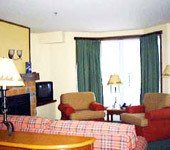 Located at the heart of Tremblant Village is the four star Les Suites, which offers a superb standard of accommodation to our groups. The establishment is a mixture of ‘condos’ and hotel rooms offering doorstep skiing - you can step straight off the slopes and into a magnificent timber lobby with stone fireplace. It is probably the best located Hotel in the resort (probably because the company that built the resort owns it)! 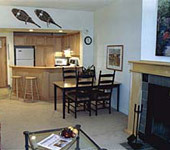 The condos hold four to eight people in a variety of configurations and the hotel rooms hold four people in two queen size beds. All are en-suite, with cable TV, radio, telephone and hairdryers. Meals are taken at Casey's Bar & Grill a local restaurant within short walking distance of the hotel.